Single and love playing golf? 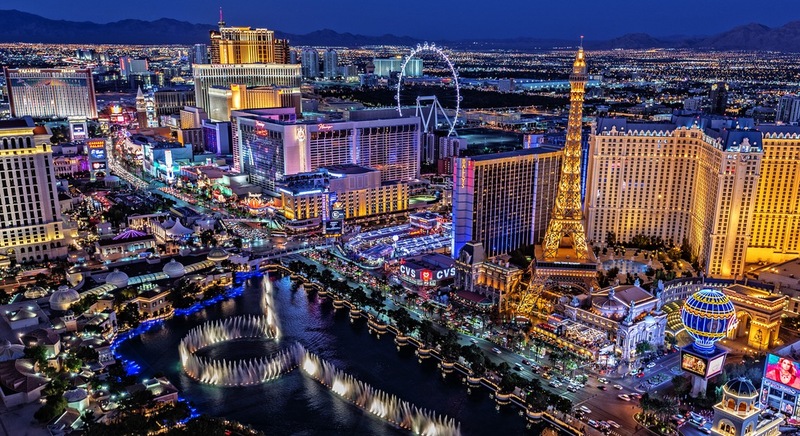 Las Vegas may just be a destination calling you. What better way to discover this fascinating city and the golf it has to offer than by joining a fully escorted golf tour. It is the perfect way to kick back, laugh it up, and find yourself getting into just the right amount of fun and trouble with other like-minded golfers. Vegas is overflowing with wild and wonderful experiences. Take an evening walk along the Strip to see Las Vegas come alive with a rainbow of neons. You’ll soon find yourself walking amongst your favourite movie characters as entertainers adorn the street eager to capture your attention. Rise above the hype of the city on the High Roller, the tallest observation wheel in the world with a height of 168 metres. Or, you may wish to get up to mischief with your favourite celebrities at Madame Tussauds. Cirque du Soleil has got you covered! Located at the end of the Glitter Strip, The Mirage is hosting a Beatles-inspired performance, LOVE, featuring stunning acrobatics, aerials, clowning, and dance in a kaleidoscope of colour and pizazz. This spectacular show is absolutely a must, and you will definitely catch it on a fully escorted Go Golfing Vegas Tour! Blessed with magnificent views, the Mojave Desert offers scenery and signature holes to tantalise. Joining the inner circle of outstanding desert golf destinations, you can play some of Vegas’ best-manicured greens and emerald fairways. Play Las Vegas Paiute Golf Club on Paiute Indian Reserve, 25 minutes from the strip, where you’ll enjoy uninterrupted views of the Sheep Range and the Spring Mountains playing the Wolf Course, the best of three Pete Dye designs. Set on a luxurious lake just 25 minutes from the Vegas strip, Reflection Bay Golf Club is a Jack Nicklaus signature design course. Ranked #4 in Nevada by Golf Week and rated among America’s 100 greatest public courses by Golf Digest, it has seen pro golf stars challenge its striking water looks. Then, there is the illustrious Rio Secco. Carved from desert plateaus and canyons in the foothills of the Black Mountain Range, the course serves up some of Southwest’s most memorable holes. Bringing golfers together for the best time of their lives is what drives the team at Go Golfing. We put the fun and adventure in every itinerary. And this is only the start of what we do. Go Golfing, Australia’s most awarded golf tour operator, offers fully-escorted golf tours to alluring destinations all over the world. Group tours have the benefit of having a dedicated host to look after the group and to ensure everything runs smoothly. Our attentive hosts are there so you can take it all in without a care in the world. Should anything happen, the tour host and the Go Golfing team get together to ensure your comfort and safety. We’ve got your back. If you are interested in room sharing, we invite you to register on our solo registry. Then, we can let you know about up-and-coming room share opportunities. We’ll put prospective room share partners in touch with each other before anyone commits to sharing. Then, you can decide whether it’s for you or not. 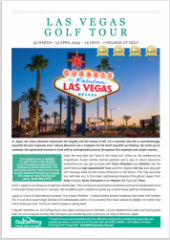 Check out Go Golfing’s fully-escorted Las Vegas Golf Tour. You’ll be lapping it up in style as glitz, glamour and golf will be high on the agenda when you hit the glitter strip for a week filled with fun and friendship.